The source of the White River is in the Boston Mountains of northwest Arkansas, in the Ozark-St. Francis National Forest southeast of Fayetteville. The river flows northwards from its source in northwest Arkansas, loops up through southwest Missouri through Branson, Missouri. In Branson the river is actually Lake Taneycomo since it is held back by the Powersite Dam. The Powersite was the first dam on the White River. The flow into this comes from Table Rock Lake and down stream flows into Bull Shoals Lake where it travels back into Arkansas, and then heads generally southeast to its mouth at the Mississippi River. The water that is released from under the Table Rock Dam creates Lake Taneycomo (has a river feel and is known for its record size trout both brown and rainbow). Folks have enjoyed floating the White River for years in Jon Boats and canoes and now kayaks. Kayaking is one of the fastest growing sports in the nation and a great way to get to see the Ozarks and enjoy nature at its most intimate level. The Branson/Lakes Area offers over 200 miles of spectacular hiking, biking and horseback-riding trails. This scenic park walking trail is located on the banks of Lake Taneycomo in North Beach Park. The park features a walking trail along the lake that connects to the Branson Landing boardwalk which totals a 3/4 mile. Other park features include two fishing docks, picnic tables, barbeque grills and horseshoe pits. Lakeside Forest Wilderness Area is in the heart of Branson and offers a nature escape with 140 acres of wooded and rugged hill country. Both visitors and local citizens can enjoy this unique park with its two woodland trails that wind through forest, along bluffs and across glades. A set of 315 stone steps lead down toward Lake Taneycomo along a path that features a waterfall and cave. Located off Fall Creek Road just south of Highway 76, the park is open daily from 7:00am to 7:00pm in the summer months and 7:00am to 5:00pm through the winter. The property also includes the Lyle Owen homestead, originally built in 1911, as well as a barn and almost 2,000 feet of hand-built stone walls. The master plan for the entire property includes a new entrance, signage, additional trails, and the eventual restoration of the homestead. Picnic areas have already been added at the trail head, the Owen Homestead, and at the south end of the loop trail. 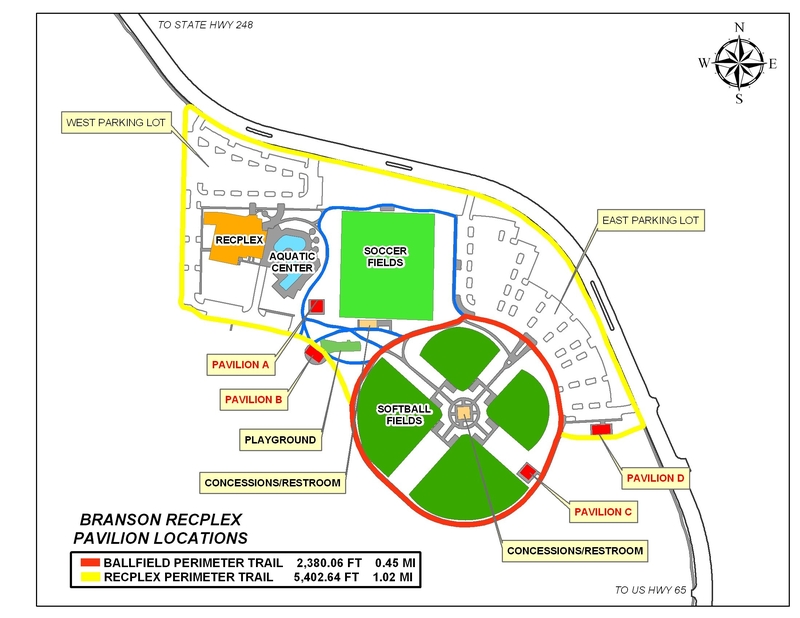 A brochure, featuring a map of the trails and history of the site, is available at the Branson RecPlex. 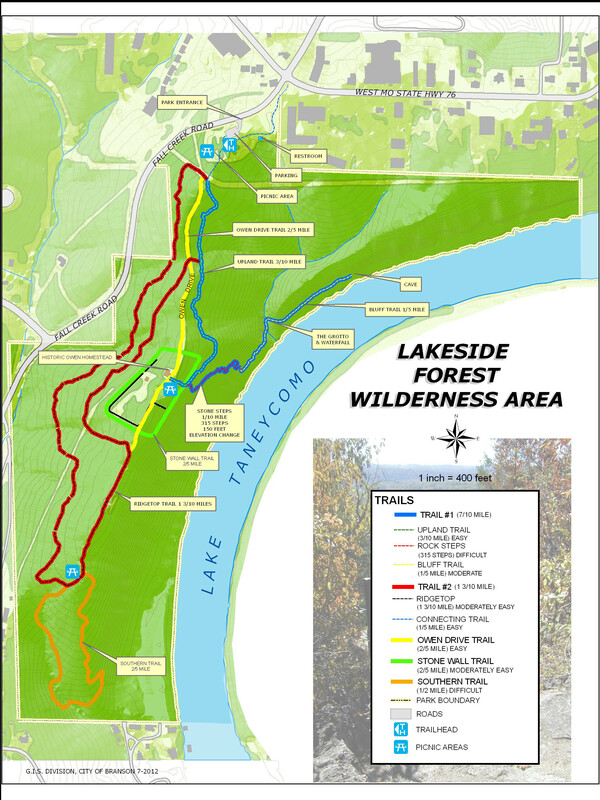 Trail 1 - starts through an upland forest where mature trees dominate and the fairly level 3/10 mile trail makes for an easy walk to the steps. Along this portion you can relax on one of the rough hewn benches built by local the Boy Scouts. A set of 315 stonework steps lead down toward Lake Taneycomo. Fairly steep in design, this part of the trail takes some agility, along with a good pair of lungs and comfortable walking shoes. Many spots allow passage for only one person. The steps were built from 1937-1938. Inscribed in mortar on a step near the bottom are the building dates and the names of the workers, along with this testament of their hard work, “Let those who tread here not forget, that these steps were not made of stone and mortar alone, but of sweat, blood, and agony.” While walking the steps, you will see the first of two caves located in the wilderness area. At the bottom of the steps, the 1/5 mile Bluff Trail will take you by a grotto and waterfall and end at the Old Soldier's Cave. The total mileage for Trail 1 is 7/10 mile (one way). Trail 2 - winds its way through forest and glades, making a 1 3/10 mile loop. This fairly level trail best suits families with small children and folks who desire an easier stroll. About halfway down the trail is a picnic area with tables. Oak-hickory forest makes up much of the woodlands, and during the spring, blooming eastern redbuds and flowering dogwoods enhance the landscape with their striking contrast to the stark forest. Also, note the large cedar-like trees with multiple trunks called Ashe’s Junipers. These uncommon trees are unique to the glades. 4. Please stay on trails at all times. These trails have been designed to discourage erosion and harm to natural communities. 5. Please stay within park boundaries. Respect land owner's rights and private property signs. 8. Destroying, cutting or removing gegetation, including wildflowers, is prohibited. 9. Foot traffic only. No motorized vehicles allowed. 10. Please keep dogs on a leash and clean up after them. 1. Use handrail at all times. 2. Children under age 8 must be accompanied by an adult. 3. Stay on the established trail at all times. 4. Running is not allowed. 5. Throwing or dropping of objects is prohibited. 6. Footwear suitable for wet walking surfaces is recommended (sandals, slick soled shoes and high heels are not recommended). 7. No animals allowed on steps, except service dogs. 8. Hiking the steps is not recommended if you have heart or breathing difficulties, have had recent surgery or illness, you are pregnant, you have a fear of heights, or any condition that may prevent you from strenuous exercise. 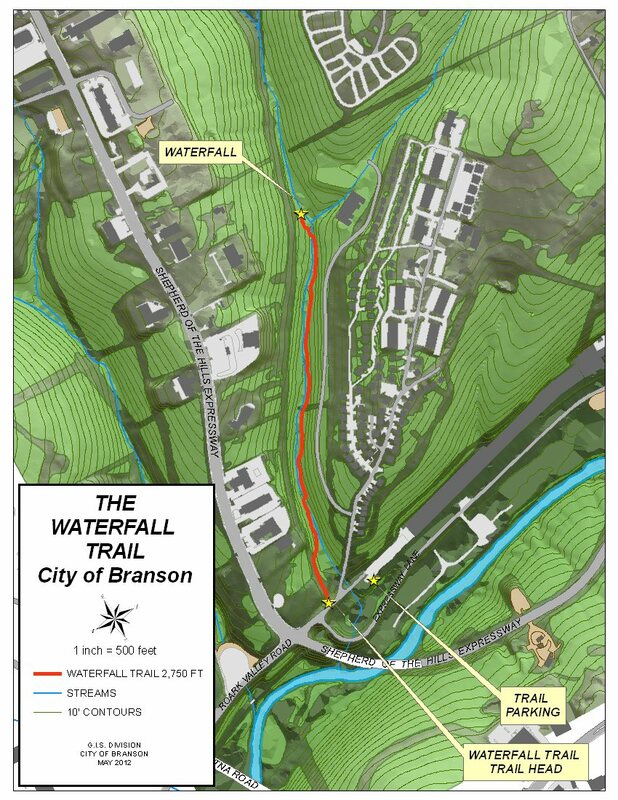 The Waterfall Trail is one of the newest trails recently developed within the city. The trail runs along an un-named tributary of Roark Creek and includes some beautiful rock formations, a waterfall and a dense tree canopy. The 2/3 mile long trail is an unpaved footpath, rugged in some locations and crosses a creek in two locations. Since the trail runs along a natural creek, it is subject to closure during and after heavy rainfall. The trail is located about 300 feet north of the intersection of Roark Valley Road and Shepherd of the Hills Expressway. Limited parking is available near the trailhead. Sunset Park is located along Lake Taneycomo, and features a newly paved and lighted 6/10 mile walking path. Exercise stations are placed along the path to increase your heart rate. A disc golf course can also be found in the interior of the walking path, giving an element of entertainment while walking. The Park is open from 6:00 am - 10:00 pm. 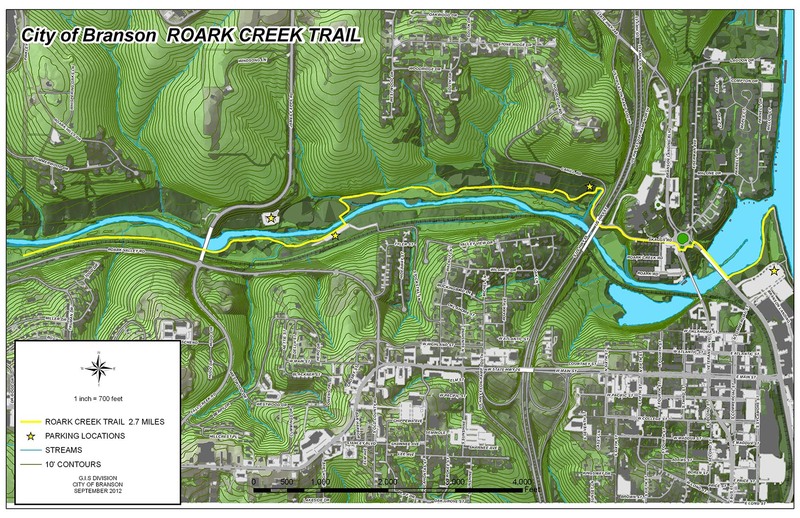 The Roark Creek trail is a paved trail that follows the picturesque Roark Creek from Lake Taneycomo up through the Roark Creek Valley. 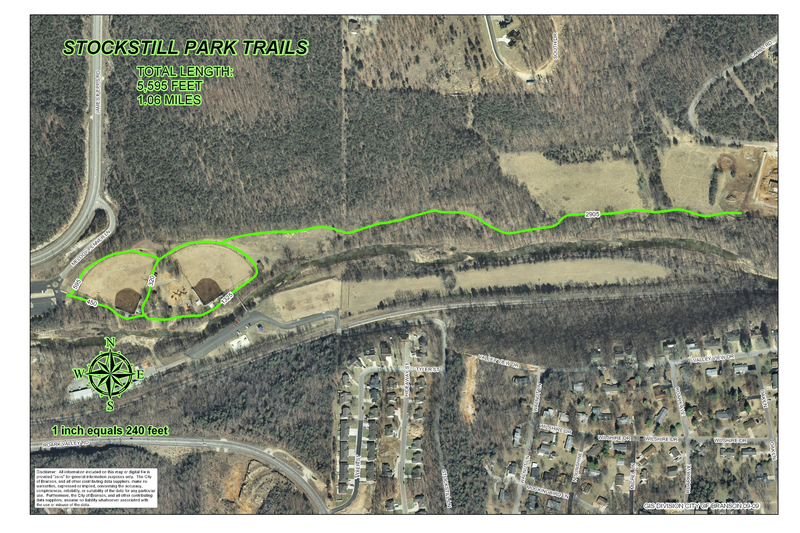 This trail connects Stockstill Park with North Beach Park and ultimately the Branson Landing. At present, the trail is approximately 2 2/3 miles long. Future extensions will provide connections to the Waterfall Trail and Henning Conservation Area. The Branson RecPlex is a popular destination for walkers. A one-mile asphalt walking path loops around the entire complex. Whether you walk a leisurely pace with your dog or power walk for exercise, you will have lots to see at the complex, including the aquatic center, a ball field complex, soccer fields, park pavilions, and a playground. Restroom facilities are also available. The Ruth and Paul Henning Conservation Area is located on the west side of Branson on Highway 76, 0.75 mile west of the Highway 376/Highway 76 intersection. To access the Henning Homesteader's Trail, on the north end of the Conservation Area, travel east on Highway 248, 0.25 mile from the intersection of Highway 465/Highway 248. Turn right on Sycamore Log Church Road and go south 3.4 miles to a gravel parking lot adjacent to Roark Creek. This area is mostly forest. Facilities/features: hiking trails, White River Balds Natural Area, and a permanent stream (Roark Creek). The Conservation Department broadcasts information about the history and folklore of the area on radio station AM 1630, which can be picked up by travelers on Highway 76, between Branson and Silver Dollar City. Look for the frequency on signs in the parking area on Highway 76. The trail is ADA accessible with the exception of a section along Cahill Drive. The trail can be accessed from North Beach Park and Stockstill Park.